Structural Integration is the holistic system of soft tissue manipulation and movement education that organizes the whole body in gravity. It was founded by Dr. Ida Pauline Rolf in the 1950s. It re-educates the body through movement and touch and systematically releases patterns of stress and impaired function. The primary focus of Structural Integration is to facilitate a healthy relationship between gravity and the body. By lengthening and opening connective tissue, the thickened, toughened tissue becomes soft, re-hydrated, and more pliable, renewing movement and flexibility. Structural Integration changes the body’s compensations as it organizes and balances the tissues. The systematic approach to the relation of gravity through the myofascial layers aligns the body and improves posture. As your body lengthens it allows each muscle the space it needs to work and gives joints the freedom to function properly. Gravity is the pull on all bodies in the earth’s sphere toward the earth’s center. The earth’s gravitational field is the most potent physical force the human body has to deal with. Gravity constantly pulls on any soft, pliable mass and causes it to become a formless, chaotic and spherical unit. The body has a great deal of plasticity and is much broader at the top than base so it greatly effected by gravity when imbalances occur. 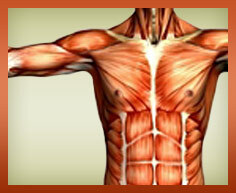 Connective Tissue is very tough, strong tissue otherwise know as the myofascial system. This connective tissue is the support system of your body. All the major systems in the body (circulatory, digestive, nervous, musculoskeletal, and organs) are wrapped in connective tissue. Healthy and balanced connective tissue is flexible, elastic, long and resilient. The tissue absorbs and responds to gravity, illness, injury, emotional trauma and everyday stress. Any of these factors will immediately or eventually cause an imbalance in the tissue system. Imbalances are identified as short, thick, de-hydrated tissue which impairs joint mobility and muscle function. The body displays imbalances as chronic pain, discomfort, stiffness or decreased flexibility and movement. Connective tissue has memory and any imbalance in the body imprints as change in the internal structure and has a long-range and cumulative effect. The body may attempt to return to its original state but without assistance it remains misaligned. While Structural Integration is primarily concerned with physical changes in the body, if does effect the whole person. We are made up of complex emotions, attitudes, beliefs, behaviors and habits as well as the physical body. All are related. Align the physical structure and it will open up the individual’s potential. Clients often report positive changes, less stress, increased self-confidence and improved ability to adapt to life’s challenges. As far as the actual experience is concerned, the area being worked will vary in sensation and feeling depending on many factors. Feelings can range from momentary discomfort to pleasurable releases. Kerra’s goal is to make each clients experience one of self-empowerment. The process is yours, not the practitioners. The work will proceed at your level of comfort. There are ten sessions, each one building on the last. Each session lasts approximately ninety minutes and should be scheduled once a week. The best attire for women is a two-piece bathing suit, or loose, short, running shorts and sports bra. For men, a Speedo or loose, short, running shorts. Awareness is an important aspect of the clients experience and is emphasized throughout the process. Kerra uses clear communication with every client so that you are aware of your body and the effects of the work so that you can provide valuable feedback. During each session, the client is taught to understand what is happening to their body and why so that they become aware of the results of each session. Client’s are shown specific structural and functional imbalances and educated on how to change habitual holding patterns. They are also taught how to re-pattern these habits and how to match functional integration with structural integration. As a result, the client is able to keep the beneficial effects of the ten-session system, continue to improve long after the ten sessions are complete and assume responsibility for their continued health.